Management proved that this high-yielding dividend stock is no flash in the pan. In mid-August, I tapped a little-known master limited partnership (MLP) stock as a high-yield dividend candidate that was ridiculously cheap. That stock was Enviva Partners LP (NYSE:EVA) -- a company that provides wood pellets to northern European energy companies that are trying to cut down their carbon footprint. In turns out the timing was prescient (read: lucky), as the stock was up 16% during the month. When you throw in the dividend that was paid on Aug. 11, that means it solidly outperformed the S&P 500. EVA Total Return Price data by YCharts. What were the two main catalysts for Enviva's rise? 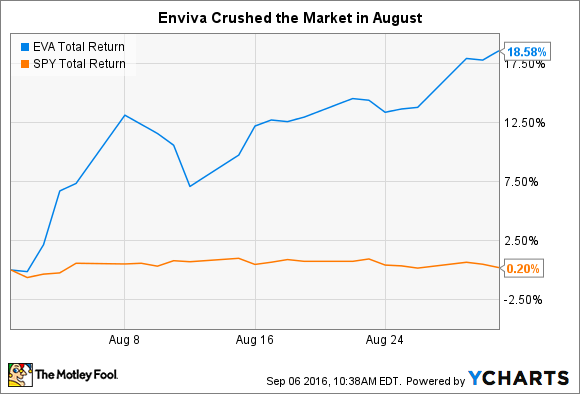 The first -- and by far the most important -- catalyst for Enviva was the release of the company's second-quarter earnings in early August. Revenue for the quarter grew a modest 9%, but earnings came in way ahead of expectations at $0.47 per share. The company demonstrated that it was becoming much more efficient in its operations, as its margin per ton of pellets improved 3% from $41.94 last year, to $43.11 today. Critically, that meant that Enviva had a coverage ratio of 1.5 for its dividend payout. In essence, this means that it only used 67% of its distributable cash flow (DCF) on its dividend -- far ahead of its goal of a 1.15 ratio, or 87% of DCF. That meant that the 9.5% yield the stock was offering at the start of the month was relatively safe, and income investors likely took notice. That leads to our second catalyst: analyst attention. A number of investment firms came out with positive price targets for the stock. Most notable was Citigroup. Although the firm gave it a "Neutral" rating, its price point of $26 per share was 18% higher than where it was when the month started. Deeper into the analysis, the Citi analyst said, "[W]e believe it has a strong visible near-term growth story supported by quality contracts and visible drop downs but is exposed to long-term trends that favor other renewables compared to biomass ." In other words, over the next few decades, solar, wind, and other forms of biomass may make more sense for northern European power companies to use. But given that the average contract length for Enviva is eight years long, there's a good chance the company will continue to churn out lots of distributable cash flow. Signing further contracts to meet demand in northern Europe -- which would be evidence of the company's moat derived through pricing power and logistics. A DCF coverage ratio that continues to be well above 1.15. Margin per ton to continue moving up from last quarter's level of $43.11. As the Citi analyst mentioned, all three of these will be important to watch, as investors need to be aware of any shifts toward other types of renewable energy on the other side of the Atlantic.